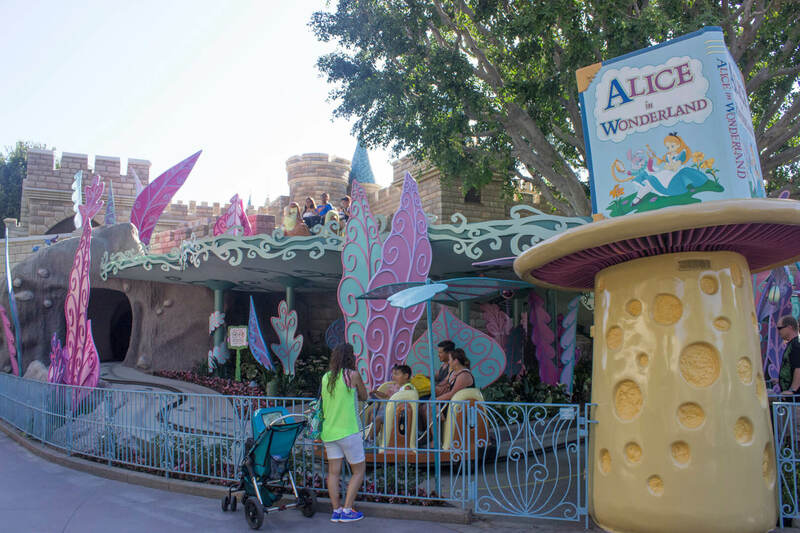 The long planned update to Alice in Wonderland debuted at Disneyland Thursday. Part of the update was to deal with safety issues raised in 2010 when a worker slipped on the outside portion of the upper track. After that incident, temporary safety rails were put in place while Disneyland and Walt Disney Imagineering worked to resolve the safety issues to the satisfaction of all parties, and make the end result a design worthy of Walt Disney’s original Magic Kingdom. Besides the safety enhancements, WDI took the rehab time to install several new Alice figures and many new digitally projected effects. 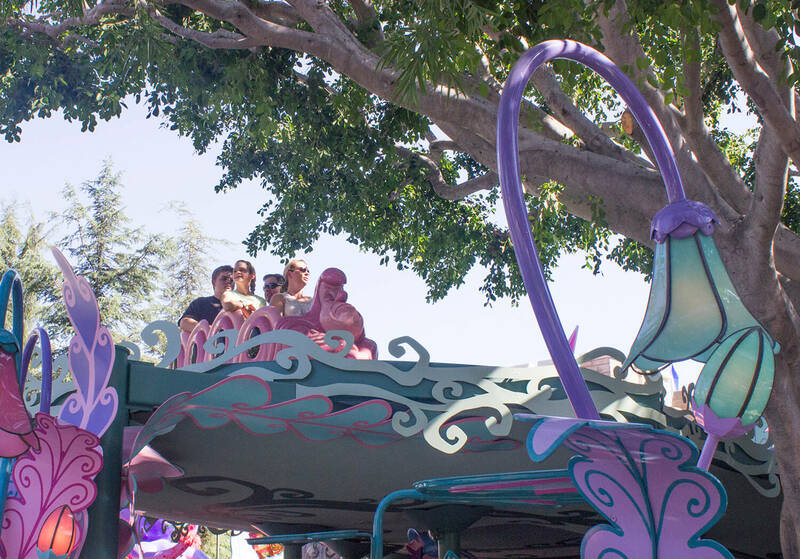 New effects can be seen immediately as one rides down the rabbit hole into the attraction. A fully animated scene from the movie is projected onto a set piece showing Alice chasing after the White Rabbit. There are several more projected animated bits in the flower section and in the Queen of Hearts section. None of the figures feature video-projected heads, like those seen in the Seven Dwarfs Mine Train attraction in Walt Disney World’s Magic Kingdom, despite the rumors on other Disney fan sites. The newly rebuilt down ramp still features the twists and turns regular Disneyland visitors remember, albeit on a wider track. The new rails on the exit (left) side of the vehicles reflect the vine architecture of the exterior. There is also a digitally projected animated tea party seen when entering the final scene at the bottom of the down ramp. Riders in the caterpillars enjoy a ride down the rabbit hole and out on the big vine at the new and improved Alice in Wonderland attraction at Disneyland. A view of the underside of the new upper twisting vine that park guests ride on in the caterpillars on the updated Alice in Wonderland ride. Park guests ride down the twisting vine, rebuilt with new safety rails and made wider to accomodate guests during evacuations. As to why it took so long to come up with this design and more, no one will talk on the record. I rode the attraction three times while shooting the video and must say I thoroughly enjoyed the changes. Instead of static still images of a gopher being hit across the croquet field in the Queen of Hearts scene, we get a fully animated image of the gopher. The projected flowers, and more, add to the fun and visual richness of the classic attraction. This is not the first time full moving animation or live action has been used in an attraction to add movement that would otherwise be prohibitively expensive. The Haunted Mansion first used it for Madame Leota and the singing busts. At Walt Disney World, there were many projectors used in the attraction “If You Had Wings.” At the top of the lift in Splash Mountain there is an animated shadow effect of B’rer Fox threatening B’rer Rabbit – produced by the author. But with new digital projection technologies, these effects can be used in a lot more places never considered before, and I like it. If this is a sign of what could be coming as future enhancements, or in other dark rides, it is a very welcome sign. 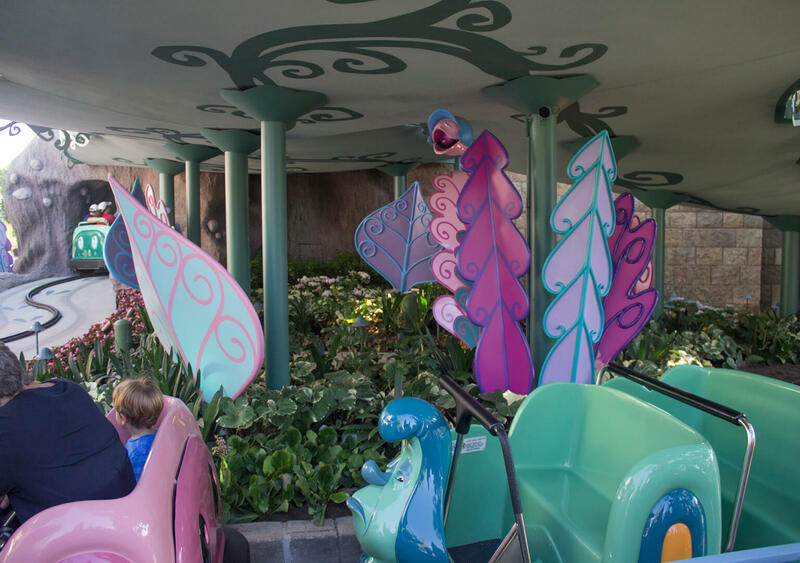 It gives Imagineers a valuable tool to add to their arsenal of design tricks. I honestly thought I was going to hate this. I was not looking forward to it. I guess I was afraid it would lose its old fashioned dark ride charm. Boy was I wrong. I totally approve. These changes really bring out the ride in a new way. It feels more alive. More like one is in the cartoon. Yes, it’s too bad they had to change the outdoor portion, but they worked well with what they had. I can’t wait now to see what they do to the other Fantasyland classics! It would be interesting to see them do this to Peter Pan’s Flight, since it is so dark and hard to see many things, and it also flies by scenes so fast! I really really LOVE the enhancements it keeps walt’s touch in there but it feels really new! I really hope they are going to use this sort of technology in Peter Pan’s Flight i hope they do! It would look so good with peter pan’s flight! But otherwise, yes, some of the “classic” Walt-era dark rides that began and ended with Disneyland (including Mr. Toad and Pinocchio) could use a little imaginative tweaking to take them beyond the Cardboard Cutout Flat, and projection does add a few new effects without turning it into Spiderman. Safety needs forced them to take a look at Alice after twenty years, hopefully a little success might spark them to take a new look at others. Very nice! One of my favorite dark rides and it looks as if they did a great job with the upgrades. I’d love to see a picture of “old vs. new” since I’ve never been to Disneyland and can’t really visualize the work that’s been done. I love this! They recently did a very similar enhancement to the Little Mermaid ride in DCA that paid off. This article is so uninspired and badly written. Reflects badly on Ricky, who is excellent. This critique is the most uninspired and immature I have ever read in my more than 35 years of writing. You should also note that Ricky hired me for my abilities, and is my editor. First of all, I don’t think your article is badly written at all for a blog. However, if that’s his opinion then it’s his opinion. There will be people that don’t like what you have to say and they have a right to their opinion. You might not like it, but as a writer you better learn that you have to take the bad with the good and recognize people are entitled to their own opinions. That is not a nice thing to say at all. This is a completely unnecessary comment. I like it. I wish they had updated the animatronics more like the 7 dwarfs mine train ride in Florida though. But still very good updates.﻿ Can’t wait to see how they update Mr. Toad now. I love what they’ve done with the ride and I’m glad Alice is seen more in it since she is the main character of the film. Cool! new tech with classic Disney ride is great! I have a feeling that they’ll be doing this to the other dark rides in Fantasyland.